the Nutria could pass for a Beaver. to claim you are still a believer. Thanks to the maxims of one of my children’s grade school teachers I realize that whenever you point an accusing finger at anyone that three of your fingers are pointing back at you! In church, I learned that he who throws the first stone should be without sin. So, with all that piled on top of my conscious I freely admit that I am full of fault. I once took a tiny plastic alligator when I was in Kindergarten (I was forced to return it, but certainly would have if given enough time). Now that all that has been said, I will now point a finger. My respectfully humble, yet righteous, finger is currently directed at the recent Winter Issue 2013 of the Detroit Zoological Society- a magazine called “Habitat.” I am not a member, nor have I ever been a member, of the Society but just happened upon the issue. 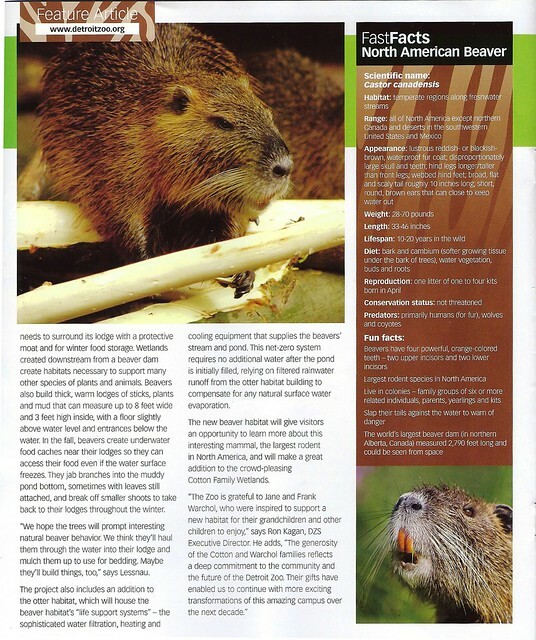 The magazine’s feature article discusses the new underwater Beaver habitat under construction at the zoo. 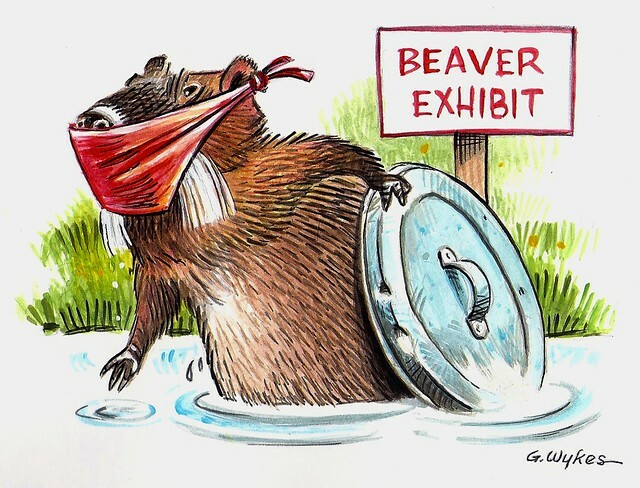 It also features a nice little side bar highlighting Fast and Fun Beaver Facts such as the four “powerful, orange-colored teeth.” The piece is illustrated with three large color photographs (see above and below). In all, it is a beautiful article and overall I have no quarrel with the content. Although teeth can’t be “powerful,” I would be getting picky beyond belief if this was my tact. So, what’s the issue with this issue? All three of those photographs are of a Nutria rather than a Beaver. Let me repeat – the pictures show a well-fed Nutria instead of a flat-tailed North American Beaver. If this publication was from AARP or something, I would not be so quick to point fingers since the two creatures can be confused with blurred vision. Because we are talking “Zoological Society” here I feel the fault more egregious. like a fox is to a retriever. is there a chance of mixing up either. 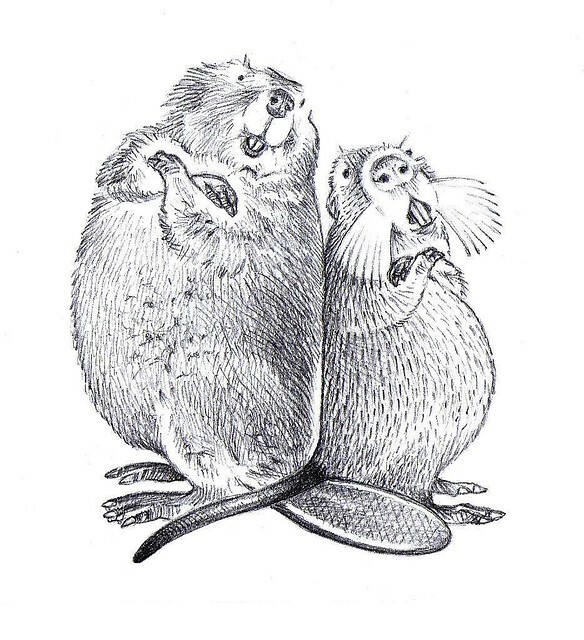 Let’s finish this thing up by saying that Nutrias don’t chew wood – even though they have “powerful teeth” and their grizzled dull brown fur contrasts with the subtly toned reddish brown fur of Le Castor (le Beaver). Native Nutrias are from southern South America and there they are known as Coypus. They made their way into North America when some transplanted individuals escaped from a Louisiana fur farm in the 1930’s. Since that time they have spread throughout the south and up the Atlantic coast – even making their way to Cape Cod (which is where I had my one and only wild Coypu sighting). They are destructive beasts that rip up vast stretches of marshland and therefore are the primary target of many State Game Agency eradication programs. There is a continued movement to harvest the nutria for their pelts and one company, called Righteous Furs, is promoting their Nutria fashions. They claim that nutrias are really nothing more than beavers with Cajun accents but they do so with a wink. No matter how you frame the picture, Nutrias are not welcome here or on any magazine page passing them off as something they are not. I leave you with a final thought directed at the Detroit Zoological Society and then I will withdraw my pointed appendage. 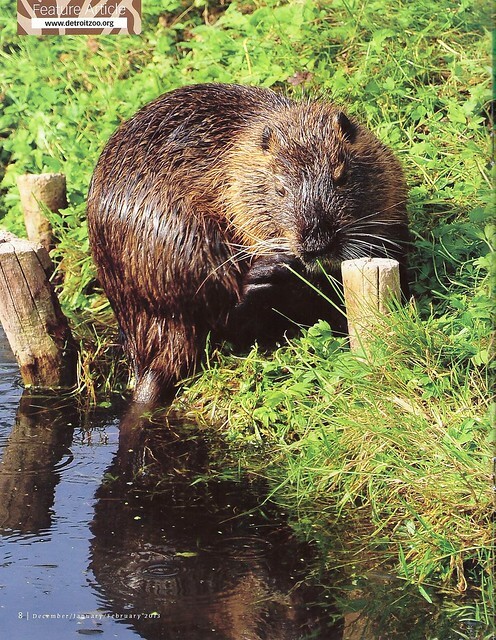 Expecting a Nutria to pass for a real Beaver is equivalent to expecting a picture of a large house cat to represent a mountain lion. No one would allow that mistake pass, now would they? he’d have to be quite a deceiver. he just might make one a believer. It snowed last night. Looking out the window I estimated that about two inches of the heavy white stuff blanketed the lawn and driveway. 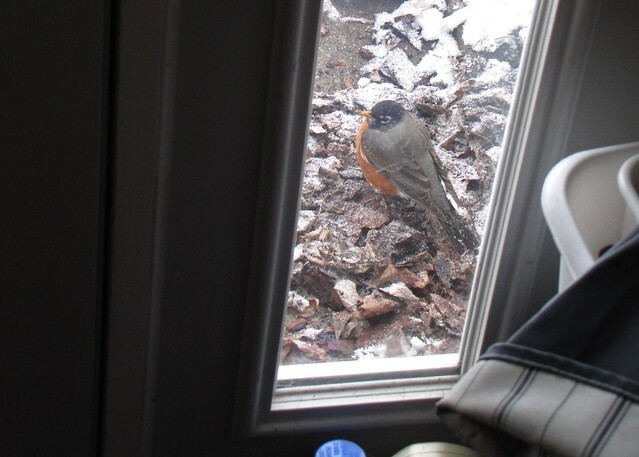 As I sat down to write my weekly blog my wife spotted a robin hanging out on the dry surface just outside the front door. I watched this bird for some time and decided to make it the subject of my computer screen words. 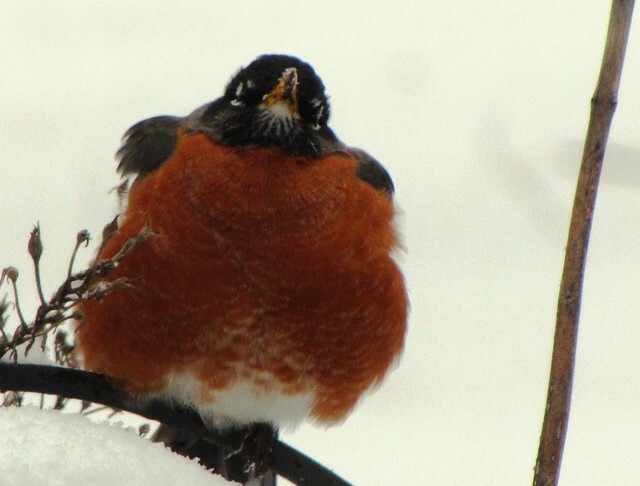 Winter robins are different than the Spring/Summer robins. Winter season birds change their behavior. They become social, group together into sizable flocks, and concentrate on eating dried berries and fruits. Their plumage becomes mottled and that famous “red” breast pales to the color of tomato soup with a heavy dose of milk in it. 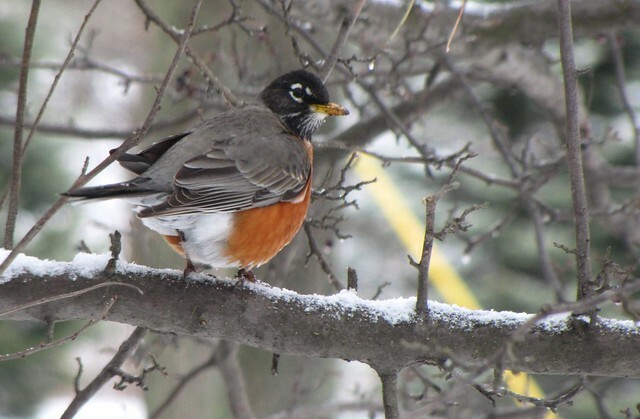 As the end of the season approaches the winter robins start to transform into spring robins. They lose the white mottling on their feathers and their colors become intense. The males especially look sharp as their head becomes rich black and their breast returns to its original tomato soup tone. The flocks break up and they return to their solitary ways. And, oddly enough, they begin to hate snow. They will do everything possible to avoid walking in it. Our front porch bird was well on the way to becoming a spring bird. 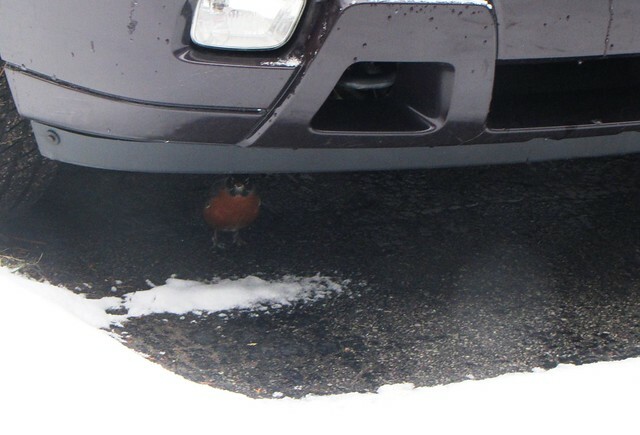 This bird was garbed in pure male colors and trying it’s best to perch in places that were devoid of snow such as under the car and the protected spot under the porch overhang. Alternating between the porch and the crab apple opposite the living room window he was far from inactive or miserable. At the crab apple he selectively plucked well dried fruits and downed them whole- just as he would on the coldest of December days. At the porchside he concentrated his efforts on a small pile of bark and dead leaves next to the planter barrel next to the porch. 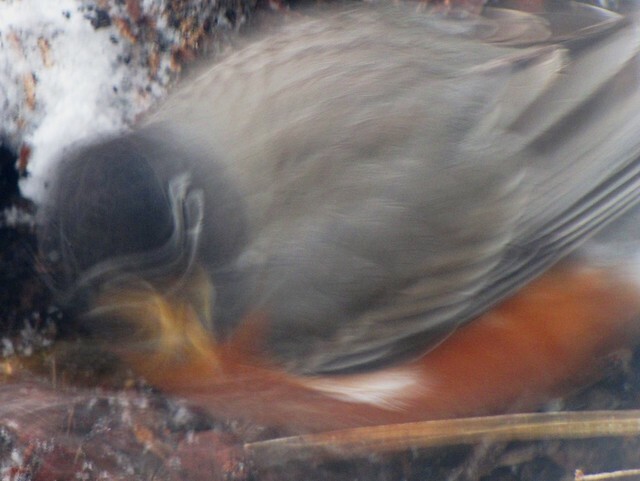 As I watched, only inches from the sight, the robin dismantled the pile. 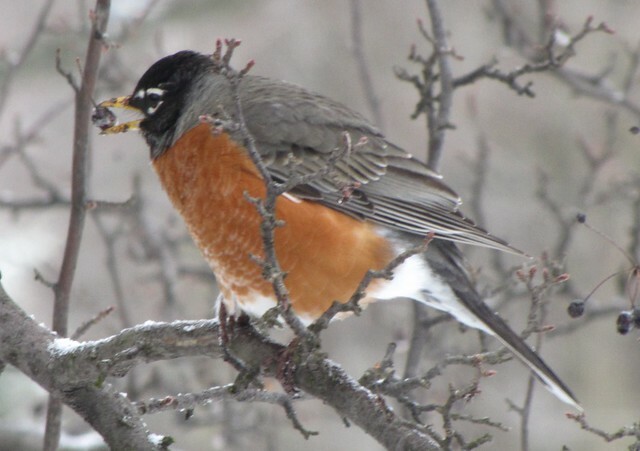 While chickens and White-throated Sparrows will scratch with their feet and blackbirds will “gape” (open their bills) to pry through leaves, Robins reach and toss aside. Every few tosses, he would stop to stare and then pluck at a newly uncovered insect. Given the gift of detail afforded by close examination, I could clearly see a record of this food hunt layered upon the bird’s bright yellow bill. A line of fruit debris marked the area high up on the beak and a layer of soil covered the tip. Snowflakes speckled the black head feathers and complemented the white eye ring. I could even see the reflection of the very window that I was shooting pictures through in his eyes. On this morning I was forced to go eye to eye with one of the most common birds in North America. This very same bird will be patrolling the green lawn in just a few more days when the calendar spring actually arrives. It will become another common sight of the variety that will not even elicit a further glance. 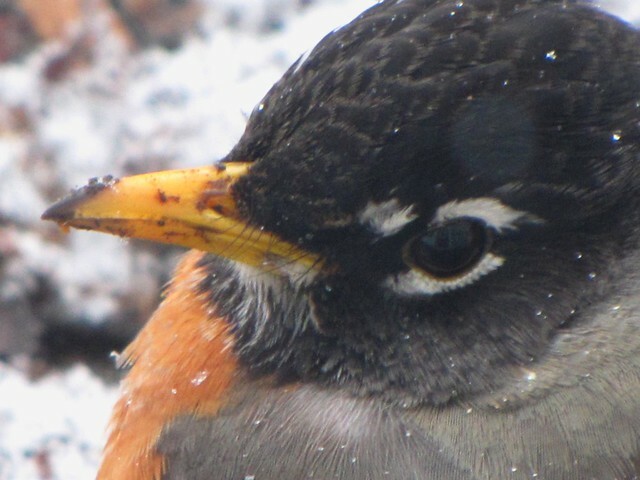 Thanks to my wife and my window I stared a winter robin in the eyes and saw the face of spring. When fresh out of college, I was still cast in the mold of a biologist and I spoke like one. I used scientific names as if they were nicknames and could roll them off like nobody’s business. Common name were, well, common and not the language of the research journals that I was trained to, well… research. Common names can be extremely misleading since folks tend to assign their own names to things (like “Mudbugs” for crayfish, for instance). It was only when I entered the field of Interpretation that I started to use common names when identifying things for other people. It was much easier to connect people to an identifier such as “Burning Bush” or “Wahoo” than Euonymus atropurpureus. It was a hard habit to break but break it I did – mostly. Today, I still use scientific names, but only when that name tells an interesting story and only AFTER relating the common name. Some names have never left my head, however, and they pop into my head before I can even react properly. Peromyscus maniculatus, the fancy name for Deer Mouse, is one of those automatic names along with Turdus migratorius (aka Robin). So it was when I encountered a specimen of Verbascum thapsis recently. It took me a minute to recall the real…er, common name… of this plant but the name “Common Mullein” finally surfaced. At this stage of the winter anything green becomes eye-catching and the fuzzy verdant leaves of this plant popped out from their brown grass surroundings. The flower-like leaf clusters are called basal rosettes – geek speak for the first year’s growth. In their second year they will each send up a tremendous flowering spike some six feet tall. The dried stalks of 2 year old Mulleins are a regular sight in the winter landscape, but one must look downward to see the basal leaves that sprouted the previous season. They are worthy of closer examination. Among the many confusing common names of this plant, Feltwort and Velvet Dock precisely refer to the fuzzy leaves of the basal rosette. The leaves are incredibly hairy. 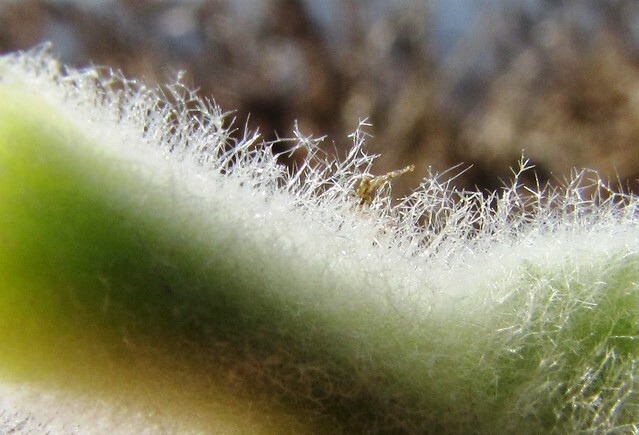 Of course, plants can’t really have hair so the reptilian brain biologist in me is tempted to inform you that these “hair-like” things are called trichomes. Since even hard-core plant biologists don’t use this cryptic term, I will instead simply label these Mullein leaves as pubescent. I did not make that up; it is an actual term with the same root word as puberty in which young human become fuzzy. Mullein leaves, if they could talk would, therefore, have cracking voices and hormonal difficulties if they were human. They are not human so we can move on in relative comfort. 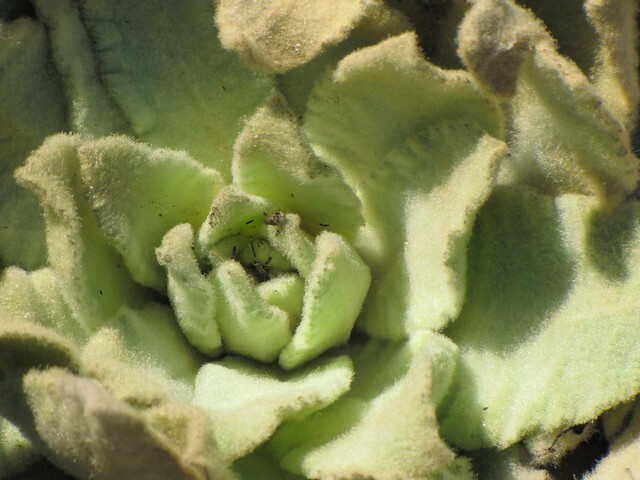 The pubescent fuzz on a Mullein leaves are in the form of star clusters on top of short stalks. 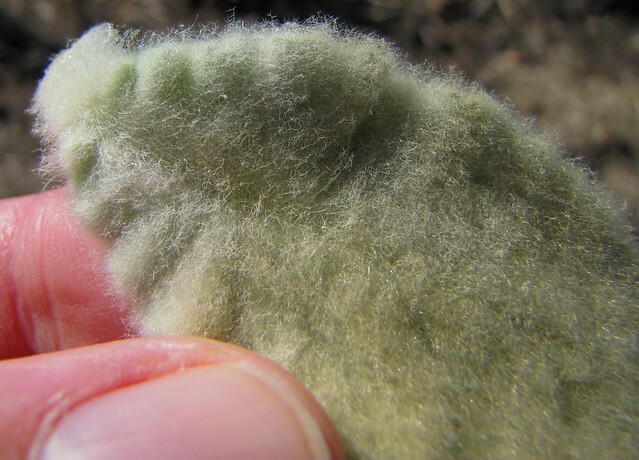 They extend several millimeters above the surface of the leaf and create a felty surface that is extremely soft to the touch. In some parts of the country these leaves are referred to as Cowboy Toilet Paper but I will not elaborate on this point! More importantly, my mission here is to get you to touch one of these leaves on a sunny cold day – put it up to your cheeks (no, not those cheeks…the ones on your face) and you’ll notice that they are warm to the touch. 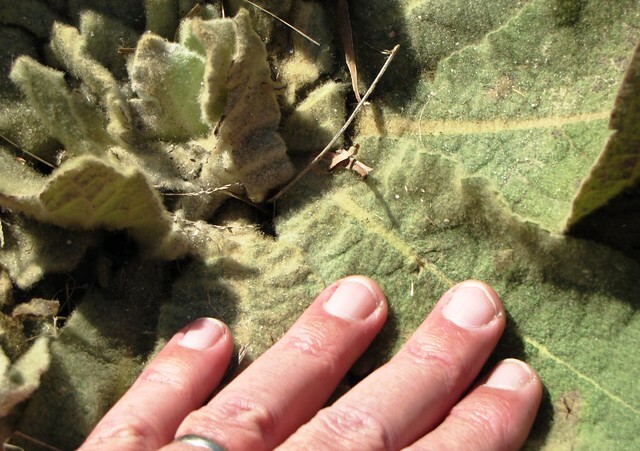 I was handling the Mullein leaves on a day when the temperature was hovering just above freezing and some of the leaves were near body temperature (or so they seemed). 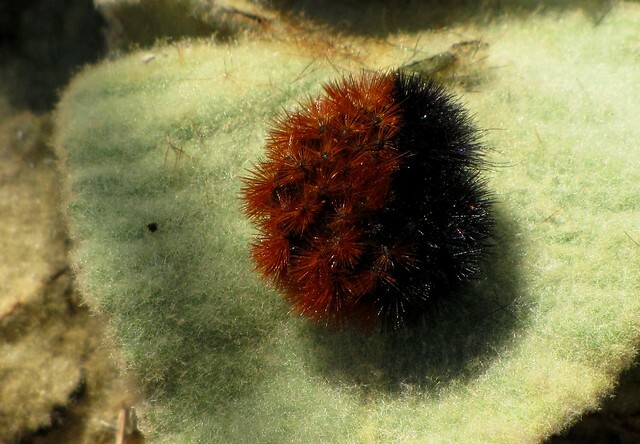 There is some belief that these “hairs” serve to create an insulating blanket of air to keep the tender cells from freezing. Studies have shown that an average leaf will be around 8 degrees F warmer than a shaved leaf even without the effect of direct sunlight. This insulating blanket also keeps the plant from losing too much water, but that is another issue which needs more study. Yet another school of thought maintains that the fuzz discourages leaf munching herbivores such as rabbits and deer. Perhaps all the above play a role in the fuzziness factor of the Common Mullein, but the heat factor is undeniable. I unfolded the leaves of several plants and discovered dozens of insects hiding out in the warm micro climate. The previous night had been well below freezing and it was clear that all these critters had huddled there for comfort. 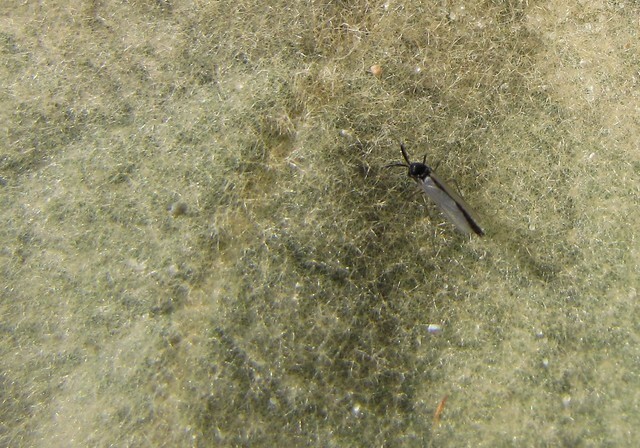 Among the menagerie of beastlets hanging around a Woolly Bear Caterpillar, a pair of midges (see above), a Rove Beetle, and an unidentified black beetle with a red thorax were among those present (see below). 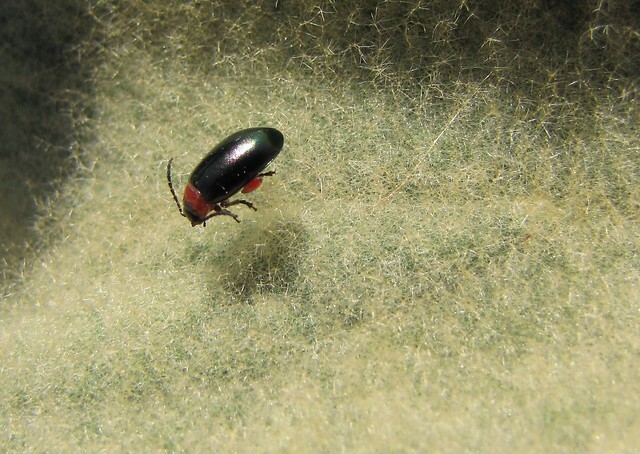 The last named beetle (which I probably could have identified by scientific name four decades ago) appeared as if suspended in space above the leaf because it was sitting atop a stellar array of trichomes. I will stop this discussion of Mullein leaves at this point because I realize that once a statement like “atop a stellar array of trichomes” makes it into a piece there is nothing more that can be said. A crow out on the ice stand s out like a sore thumb. 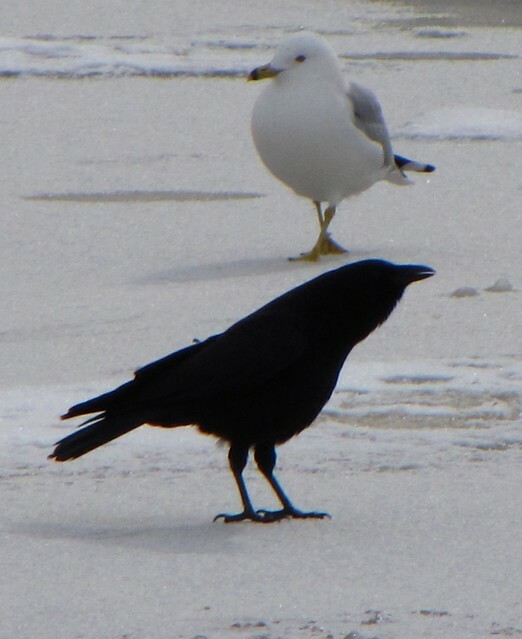 You couldn’t ask for more of a contrast than a black bird perching on a field of white river ice such as I saw recently on the River Raisin. Every time this coal-colored bird mixed in with the resident group of Ring-billed Gulls their proximity became a study in black & white and this idea prompted me to some thoughts. I can only go so far with this thought without quickly becoming redundant redundant, but there are a few semi-intelligent things can be said about this. I do not feel constrained by intelligence, however, so I will simply allow my mental stream to flow. The lone member of his kind at that particular place and time, this bird was feeding upon scraps such as dead fish, dead fish, and a few more dead fish (see how quickly I became redundant). It frequently stopped to call as if notifying any local crows that it was owner of this patch of flat cold. There were no local crows about, but perhaps this bird was keeping them away. The gulls paid no attention to him, nor did he pay attention to them. For a while they were equals among scavenging birds. Crows are a very vocal species and when they issue a “caw” they throw everything into it. Their whole body rocks up and down like a teeter totter. When calling (caw-ling), crows typically perch high up on an exposed limb in order to make their announcements. Typically calling crows are not hiding crows – they are in your face crows. In this case, the bird was totally exposed out in the open and took the opportunity to trumpet his thoughts. What those thoughts are will range from territory, local gossip, and food announcements (see http://www.crows.net/language.html.) 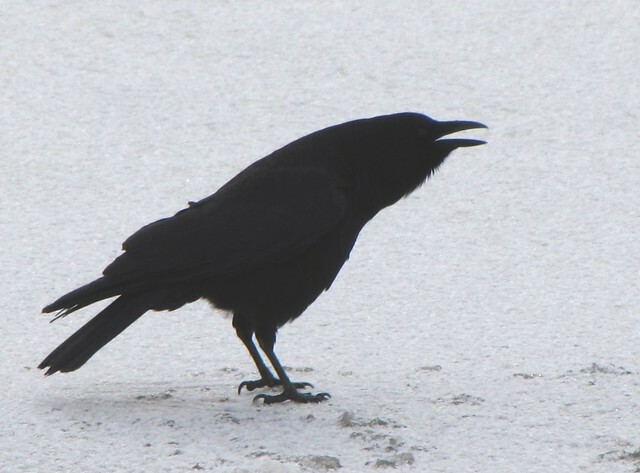 They are relayed in a series of bursts ranging from one to nine caws and the order of calling seems to make for a fairly complex crow language. 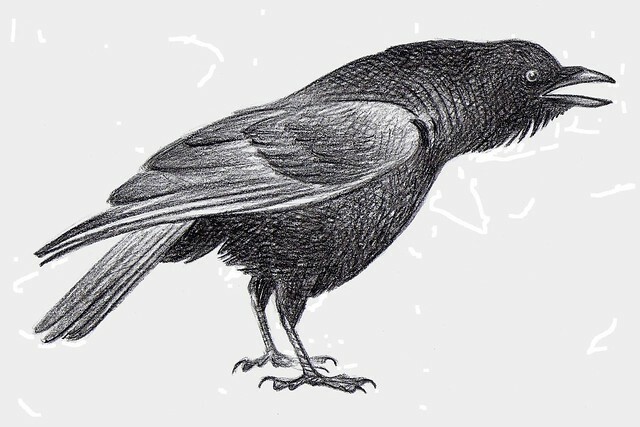 Since crows can count, recognize human faces, and identify dangerous items such as boom-boom sticks there is little doubt that crow talk is not idle chatter. 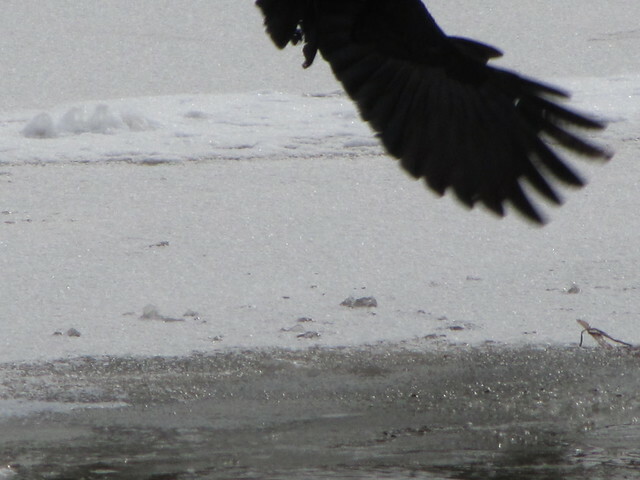 For instance, my River Raisin Crow obviously knew that I could not walk out on the ice and was not holding a boom-boom stick (it was, instead, a snap-snap box). I was, therefore, not a threat and thus the reason I was able to get fairly close (something hard to do with wild crows). Corvus brachyrhynchos, the scientific name of this species, means “short-beaked” but, as any observer can see, their beak is actually quite large. In fact it would be fair to say that the beak is “honking large.” Apparently the original name referred to the comparative size of this member next to that of the closely related Raven which has a truly honking large beak. Even though it fades in contrast with that of the Raven, this substantial beak is an adaptive trait to a life of eating everything. True omnivores, these birds eat seeds, rotten meat, garbage, and field mice with equal relish. They are fairly competent predators and will catch and kill small critters – ripping them asunder with that large beak. I do have one more crow thought to present. Crows aren’t really black, you know. Yes, they are very dark and their primary pigment is a deep brownish black. In bright sunlight they have a somewhat purplish overtone, but they do not express the iridescence of other blackbirds such as grackles. This effect is called structural color and results from the bending of sunlight due to feather structure. An ancient story about the crow tells the tale of an annoying white bird who constantly warned buffaloes of approaching native hunters. The bird was nabbed by the angry hunters and thrown into the fire. It re-emerged as a blackened being but was not silenced. To the honest human observer they present shades ranging from white to coal black. Look at a crow when it flies on a sunny day and you’ll see that the feathers reflect the bright light. From an artistic view one can’t properly draw a crow by just drawing an outline and filling it in with solid black. To do so would create a crow silhouette. 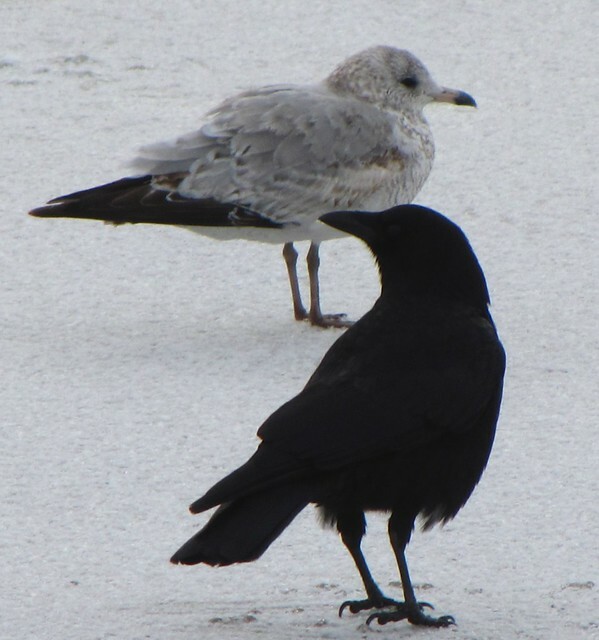 White areas are crucial to the identity of the crow and to any thoughts regarding them.